Citation: Bahloul E, Turki H, Jallouli M et al.. First-degree atrioventricular block: A rare manifestation in systemic lupus erythematosus Immunol Case Rep 2018;2(2):7-12. Systemic Lupus Erythematosus (SLE) can affect any organ system. The heart is one of the most frequently affected organs in SLE. The cardiac involvement may be diffuse, or localized to the pericardium, the myocardium, the endocardium, the conduction system, or the coronary arteries . In adults, conduction defects represent a rare manifestation of SLE and have hardly been described. We reported a rare case of firstdegree Atrio-ventricular block associated with SLE in a 15- year-old female who initially consulted a dermatologist for rash. A 15-year-old female patient was referred from a dermatologist to our internal medicine department for rash and pancytopenia. She had intermittent asthma but no other medical history. She complained of progressive fatigue, photosensitivity, hair loss, arthralgias of the knees and rash three weeks before her admission. Her physical examination revealed an afebrile patient with a blood pressure of 120/60 mm Hg. Her pulse rate was 100 beat/minutes, and her respiratory rate was 16/minutes. She had butterfly wings erythema, erythematous maculopapular lesions in the upper part of the thorax (Figure 1). Figure 1: Malar rash in a 15-year old girl. Her lungs were clear to auscultation. The heart sounds were normal with no gallops, murmur or rub. Abdominal musculoskeletal and neurological examinations were unremarkable. The remaining physical examination was normal. 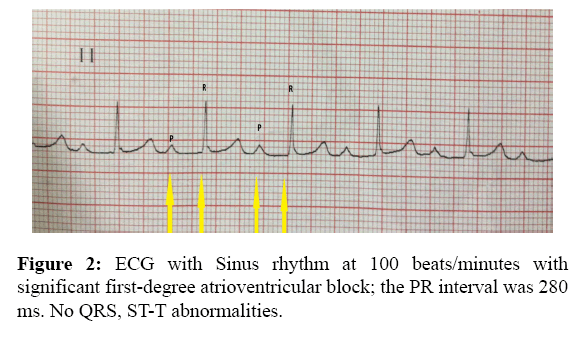 Routine screening Electrocardiogram (ECG) revealed sinus rhythm at 100 beat/min with significant first-degree atrio- Ventricular block (AVB) the PR interval was 280 ms. there were no QRS, ST-T abnormalities (Figure 2). Figure 2: ECG with Sinus rhythm at 100 beats/minutes with significant first-degree atrioventricular block; the PR interval was 280 ms. No QRS, ST-T abnormalities. Chest X-ray was normal. The patient had a haemoglobin of 7.9 g/dL, mean corpuscular volume of 80.9 femtoliter, mean corpuscular hemoglobin of 32 picogram, mean corpuscular hemoglobin concentration of 29.9%, and reticulocyte count of 25600. The patient's serum iron level was low at 6,6 /μmol/l and her serum ferritin was normal at 95 ng/ml. White blood cell count was 3.05 × 3/mm3, with a 1.53 × 103/mm3 lymphocyt count and 1.370 × 3/mm3 neutrophil count. Platelet count was 79 × 103/mm3; erythrocyte rate sedimentation was 120 mm at the first hour, C-reactive protein was negative and her liver function tests were Aspartate transaminase 112 U/ml alanine transaminase 111 U/ml, bilirubin 6 μmol/l and alkaline phosphatase 66 U/ml. Sodium was 137 mEq/l; potassium 4.9 mEq/l chloride 106 mEq/l blood urea nitrogen 9 mmol/l; serum creatinine 62 μmol/l; magnesium 1.03 mmol/l; and calcium 2.1 mmol/dl. Urinalysis did not reveal proteinuria or hematuria. Thyroid investigations were normal. Cardiac troponin concentration was inferior to 0.01μg/L. The serum C3 and C4 complement levels were low, 0.17 g/l (0.65-1.45) and 0.04g/l (0.1-0.4) respectively. Antinuclear antibodies were positive (1:1280 in homogeneous pattern), with positive anti DNA, anti-histone, anti-nucleosome and anti-ribosome antibodies. Anti-phospholipid antibody and lupus anticoagulant were negative. The echocardiogram showed a low abundance pericarditis in (Table 1). Table 1: Summary of the results of laboratory investigations in our 15-year-old female patient with first. Summarizes the results of laboratory investigations in our patient; the patient was diagnosed with SLE, fulfilling the 1982 American College of Rheumatology (ACR) criteria, with malar rash, pericarditis, lymphopenia, thrombocytopenia and the presence of anti-DNA antibodies with positive ANA. The SLE disease activity index (SLEDAI) score was 7, indicating a moderate disease activity. In our patient, the first-degree atrioventricular block was attributed to SLE. The patient was started on intravenous methyl prednisolone 1 g/day for 3 days and later changed over to oral prednisone 1 mg/kg/day. The first-degree AVB resolved completely within 3 days of therapy She experienced concurrent improvement of fatigue, arthralgias, rash, leukopenia and thrombocytopenia (Figure 3) . Figure 3: ECG normalization in the third day therapy. Cardiac involvement is very common in SLE. Prevalence of cardiac involvement in SLE varies according to whether a clinical or pathologic series is being considered. Overall, the prevalence of cardiac involvement in SLE is estimated to be more than 50% . In our department, 28% of SLE patients presented cardiac involvement at some stage of their illness . Conduction defects in SLE are well described in the literature . While congenital heart block is the most widely known and occurs in 1%-2% of anti-Ro/SSA antibody-positive pregnancies , conduction troubles are very rare in adults . Several types of cardiac conduction abnormalities have been described in SLE. Commonly reported conduction disturbances include AVB, such as first- and second degree blocks; and intraventricular conduction defects such as bundle branch blocks . Complete or third-degree heart block was also reported [6-8]. These abnormalities tend to occur later in the course of SLE with an average of 3-20 years of established lupus. Occasionally, conduction defects may occur as the initial manifestation of SLE [4-9]. Our patient presented a first degree block in her first SLE flare. In general, derangement of the cardiac conduction system in SLE more commonly affects the young and the middle-age females . Conduction disturbances in SLE have been attributed to several causes. In fact, it may result from myocarditis or pericarditis or can develop as a consequence of coronary ischemia secondary to vasculitis and atherosclerotic involvement [4-10]. Collagen deposits may accumulate within the atrioventricular node, resulting in focal degeneration and fibrosis of the conduction system . Some authors suggest that anti-Ro⁄SSA antibodies may trigger rhythm disturbances through an inhibiting crossreaction with several cardiac ionic channels [12,13]. These abnormalities also may be an adverse effect of the medications commonly used by such patients. Chloroquine is associated with a high incidence of cardiac conduction disorders, including bundle-branch blocks and incomplete or complete AVB. Hydroxychloroquine was safer than chloroquine in terms of heart conduction disorders . In SLE patients with conduction abnormalities, electrolyte balance and thyroid hormonal status should also be investigated . In our case there was no myocarditis, electrolyte disturbances or dysthyroidism. Anti-Ro SSA antibodies were negative for our patient. First degree block in our patient preceded the use of hydroxyl chloroquine. No randomized controlled trials have been conducted to assess the proper management of SLE patients with cardiac conduction disturbances. In some cases, such as patients with lupus flare and atrio-ventricular conduction disturbances, treatment with intravenous corticosteroid has been successful [15-17]. Permanent pacemakers have also been implanted in some patients with high degree atrioventricular block . In our case first-degree atrioventricular block completely resolved within 3 days of corticosteroid therapy. We reported a rare case of first-degree AVB associated with SLE in a 15-year-old female completely resolved within 3 days of corticosteroid therapy. AVB is a rare manifestation poorly described in SLE. Patients with SLE should be screened routinely for conduction defects, even if they are asymptomatic and when AVB is present, an etiological investigation should be made. Doria A, Iaccarino L, Sarz Puttini P, et al. Cardiac involvement in systemic lupus. Lupus 2005;14:683-6. Kao AH, Manzi S. How to manage patients with cardiopulmonary disease. Best Pract Res Clin Rheumatol 2002;16:211-27. Jallouli M, Frigui M, Hmida MB, et al. Clinical and immunological manifestations of systemic lupus erythematosus: Study on 146 south Tunisian patients. Saudi J Kidney Dis Transpl 2008;19:1001-8. Teixeira RA, Borba EF, Bonfa E, et al. Arrhythmias in systemic lupus erythematosus. Rev Bras Reumatol 2010;50:81-9. Ambrosi A, Sonesson SE, Wahren-Herlenius M. Molecular mechanisms of congenital heart block. Exp Cell Res 2014; 325:1-9. Sanchez RJ, Ocana MC, Garcia HFJ, et al. Complete auriculoventricular blockage in adult patients with systemic lupus erythematosus. Case series and a review of the literature. Reumatol Clin 2006;2:294-7. Moder KG, Miller TD, Tazelaar HD. Cardiac involvement in systemic lupus erythematosus. Mayo Clin Proceedings 1999;74:275-84. Barra SN, Providencia R, Paiva L, et al. A review on advanced atrioventricular block in young or middle-aged adults. Pacing Clin Electrophysiol 2012;35:1395-405. Arce-Salinas CA, Carmona-Escamilla MA, Rodriguez-Garcia F. Complete atrioventricular block as initial manifestation of systemic lupus erythematosus. Clini Exp Rheumatol 2009;27:344-6. Abu-Shakra M, Urowitz MB, Gladman DD, et al. Mortality studies in systemic lupus erythematosus. Results from a single center. I. Causes of death. J Rheumatol 1995;22:1259-64. Bharati S, de la Fuente DJ, Kallen RJ, et al. Conduction system in systemic lupus erythematosus with atrioventricular block. Am J Cardiol 1975;35:299-304. Lazzerini PE, Capecchi PL, Laghi-Pasini F. Anti-Ro/SSA antibodies and cardiac arrhythmias in the adult: facts and hypotheses. Scandinavian J Immunol 2010;72:213-22. Santos-Pardo I, Martínez-Morillo M, Villuendas R, et al. Anti-Ro Antibodies and Reversible Atrioventricular Block. New Eng J Med 2013;368:2335-7. Costedoat-Chalumeau N, Hulot JS, Amoura Z, et al. Heart conduction disorders related to antimalarials toxicity an analysis of electrocardiograms in 85 patients treated with hydroxychloroquine for connective tissue diseases. Rheumatol 2007;46:808-10. Bilazarian SD, Taylor AJ, Brezinski D, et al. High-grade atrioventricular heart block in an adult with systemic lupus erythematosus the association of nuclear RNP (U1 RNP) antibodies, a case report, and review of the literature. Arthritis Rheum 1989;32:1170-4. Liautaud S, Khan AJ, Nalamasu SR, et al. Variable atrioventricular block in systemic lupus erythematosus. Clin Rheumatol 2005;24:162-5. Saribayev M, Tufan F, Oz F, et al. Corticosteroid treatment normalizes QTc prolongation and improves heart block in an elderly patient with anti-Ro-positive systemic lupus erythematosus. Aging Clin Exp Res 2013;26:337-9.